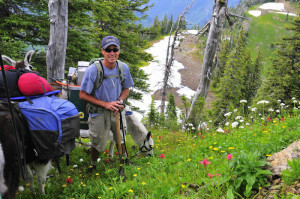 Swan Mountain Llama Trekking’s signature multi-day llama hiking vacation packages follow the Alpine Trail in Montana’s Glacier Country. 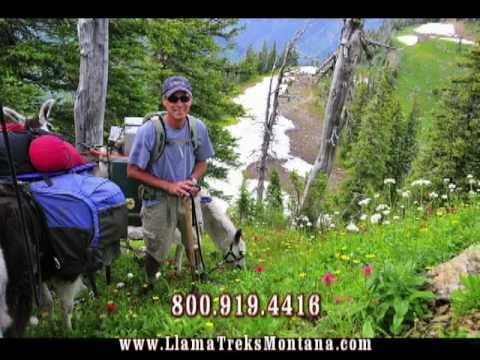 These guided llama treks are perfect for hikers, adventurer seekers and families who want the ultimate Montana llama pack trip adventure! Our 4-Day Llama Treks run from Tuesday through Friday in July and August, when the high country is accessible. We hike 3 to 8 miles per day, covering a maximum of 25 miles. 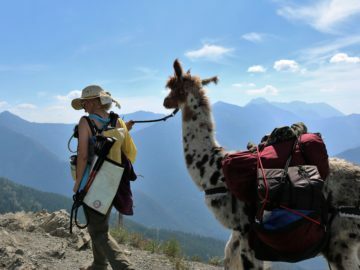 Our delightful llamas tote our gear with ease as we meander along the Swan Divide of the Flathead National Forest, a spectacular ridgetop trail with endless views of three surrounding wilderness areas, the Continental Divide and Glacier National Park. The typical group size for our hiking vacation packages is 4-7 people, and when necessary, smaller groups may be combined. Larger groups can occasionally be accommodated by special arrangement. Children are welcome, generally ages 7 and up. The Alpine Trail ranges from 6,000 to 7,500′. The hiking is moderately strenuous, on a ridgetop trail with a lot of up and down. We go at a leisurely pace with plenty of time for rest stops, lunch breaks and marveling at the fantastic panoramic views. Guests need to arrive at Swan Mountain Ranch at 8:30 am on Tuesday for their Alpine Trail guided llama trekking adventure. On our last day, right after a picnic smorgasbord lunch, the guide will pack up the llamas, and lead the trek back down to the trailhead. Once done with our hike, we’ll head back to Swan Mountain Ranch, and have you on your way by 5:00pm, on Friday. Find out why Swan Mountain Llama Trekking is your family’s best choice for hiking vacation packages in Glacier Country!